Gluten Freeways: Babycakes Named One of Best Cupcakes in the U.S.A.
Babycakes Named One of Best Cupcakes in the U.S.A.
"With famous clientele that includes Hilary Swank, Natalie Portman, and Moby, Babycakes NYC is known for its Gluten-Free, Dairy-Free, Egg-Free, Soy-Free, Agave-Sweetened" Chocolate Cupcake with Vanilla Icing. The bakery prides itself in leveraging unique ingredients to reduce the overall calories in its cakes without skimping on flavor. Agave nectar is used instead of sugar, garbanzo-fava bean flour is used instead of white flour, and cold-pressed coconut oil replaces butter. Another big seller for Babycakes it is "cupcake top," which is simply the delicious cut-off top of its cakes, reminiscent of muffin tops." 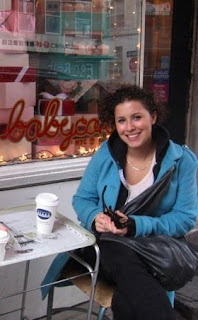 My friend Clara recently sent me this photo of her in front of the New York Babycakes location -- it makes me really excited for Babycakes to open on the west coast. Angelenos will soon be able to enjoy Babycakes in its new Downtown LA location.